Single phase drives discussed in the previous section are employed for low and medium powers. When the power of the drive is very large the three-phase converter is preferred for supplying the load. As has been described early that increase in the number of pulses of the output voltage improves the performance. 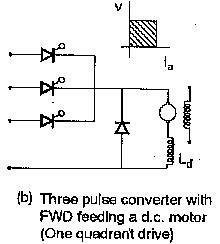 A three-phase converter can be used to give three or six pulses in the output. The output voltage has less ripple when the number of pulses increase. Therefore three-phase converters produce an output voltage with reduced harmonic content. This has an effect on the peak/average and rms/average ratios which effectively decrease. The filtering requirements are therefore less in the output circuit. The speed regulation of the drive improves and of the motor are small. In the light of the above, the motor performance will also be better in Three Phase Drives. A simple three-phase mp converter drive is shown in Fig. 4.64(a). The output ripple has a frequency of 3f. This is suitable for two quadrant operation. Among the Three Phase Drives this has higher peak/average and rms/average current ratios. These result in losses of motor and also affect the commutation capability of the motor. They are troublesome, particularly at low speeds, as the % ripple at low speeds is more. The self ventilation of the motor also decreases. This may necessitate forced ventilation at low speeds. Further the dc component of the load current premagnetises the transformer core and a big transformer is required. To avoid this dc magnetisation, special transformer winding connections may be required. The performance of the motor may be improved by an additional induc­tance in the load circuit or by suitably modifying the dc motor, as has already been discussed, i.e., designing the motor with an inherently large armature inductance, laminating the yoke and interpoles. The motor in such a case would have an improved performance with respect to discontinuous conduc­tion, commutating capability, dynamic response, torque capability for a given heating, etc. The regenerative braking is possible. However, the power factor is poor and the quality of p.f. is affected by the delay angle and harmonic content. The drive performance can also be improved by connecting a freewheeling diode across the supply. The connections are shown in Fig. 4.64(b). This drive is preferred to the above if no regeneration is required. The freewheeling diode effectively improves the line power factor, besides providing the beneficial effects of decreasing the ratios of peak/average and rms/average currents of the load by providing a kind of smoothening of the load voltage. The armature heating is therefore less. The amount of inductance required in the load for filtering the harmonics is less. The load current is less prone to discontinuous conduction. 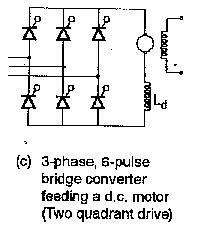 A three-phase full wave drive may be obtairied by feeding a dc motor from a six pulse bridge converter or a six pulse converter with interphase transformer. The latter is used for large load currents. These are depicted in Fig. 4.64(c). The increase of the pulses in the load is advantageous, as it effectively decreases the ratios of peak/average and rms/average currents. This improves the performance of the motor, and the filtering requirements are less. The current is continuous in almost all the operating points because of the faster rate of switching of the thyristors. The line side performance also improves because of less harmonic content in the line current. A slight improvement in the total power factor may be there. These drives have better speed regulation than single phase drives. A full converter allows negative average voltage at the load terminals thereby making regeneration possible. has six pulses. Because of a reduction in the output pulses, the output ripple increases. The peak to peak value of current is more than that in the six pulse case. But the semi converter is simple, reliable and less costly. There is a possibility of discontinuous conduction at light loads due to increased ripple, particularly at large firing angles. The fundamental displacement factor is better than that of a full converter. This improvement is slightly augmented by the harmonic content on the line side. The effect in the improvement in the total p.f. is not very much. The regeneration is not possible as the diodes do not allow negative voltage. 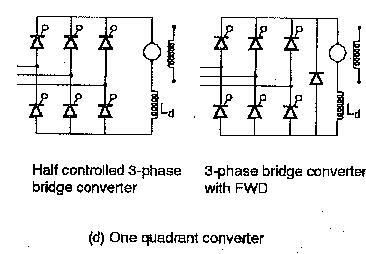 The semi converter bridge has only three pulses in the larger portion of the operating range. Even though this converter has better performance with regard to p.f. the peak to peak current increases and this is 3.11 times that of a six pulse converter(Fig. 4.65). The motor experiences more heating and the commutation tends to be sparky for a given torque. As the converter is simple, reliable and less costly, it seems to be worthwhile considering the modification of the motor design or the ways of reducing the peak to peak current. 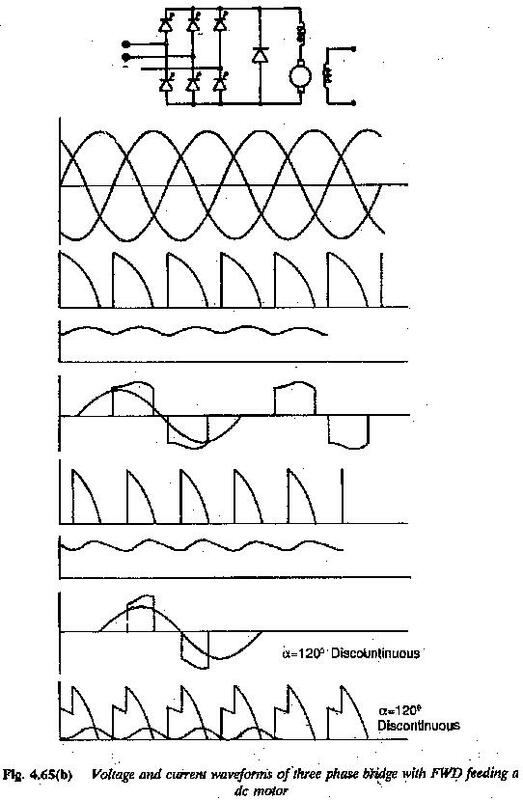 An inductance in the armature circuit is effective in reducing peak to peak current, as it smoothens the ripple content of armature current. The additional inductance is bulky, increases the cost, occupies space and results in additional losses. Because of space considerations, it is some times imperative to dispense with additional inductance. In such case the motor itself is modified in its design. (These modifications have already been indicated). These are lami­nating the yoke, interpoles, increasing the number of commutator segments and designing the armature with sufficiently large inductance. The laminated structures improve dynamic response also. One quadrant operation can also be obtained by a freewheeling diode across the load. This also provides the advantages of a semi converter, but in a limited range of firing angles. This is because the diode participates in conduction only after α = 60°. Up to this angle the advantages of freewheeling are not there. Therefore up to α = 60° it is six pulse converter. This circuit must be used with caution. 1.Three phase drives are used for large power ratings. 2.The increased pulse frequency of the output ripple reduces the filter requirements as the peak to peak ripple content decreases. The amount of inductance required for smoothing is also less. 3.Peak/average and rms/average current ratios in the load are smaller in Three Phase Drives. This tends to improve the performance of the drive motor. The outlay of smoothing inductance is also less. The heating of the motor for a given torque decreases compared to single phase drives. 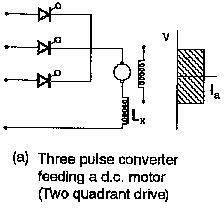 4.The commutating capability of Three Phase Drives is better than that of one phase drives. 5. The line power factor is poorer in a full converter as the firing angle is delayed. This is because of a deterioration in the fundamental displacement factor as well as harmonic factor of the line current. 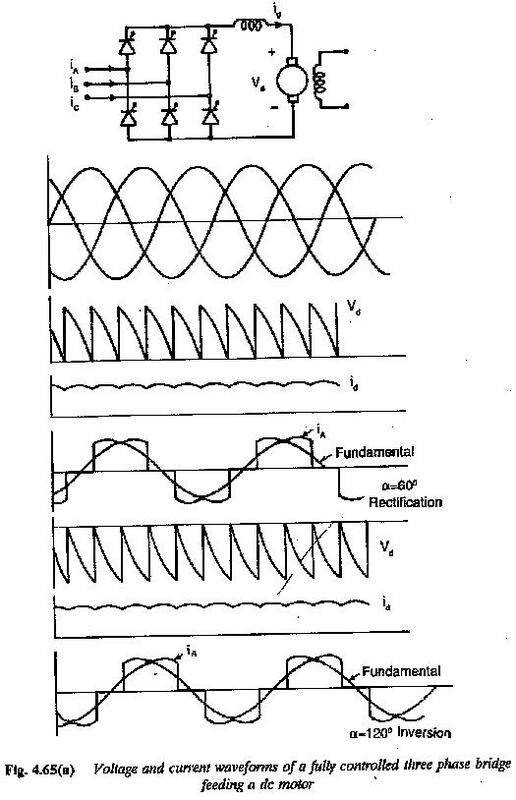 Semi converters and converters with FWD improve the fundamental displacement factor. This im­provement is possible in Three Phase Drives only in a certain range of firing angles. On the other hand single phase drives offer this improvement in the complete range of firing angles. 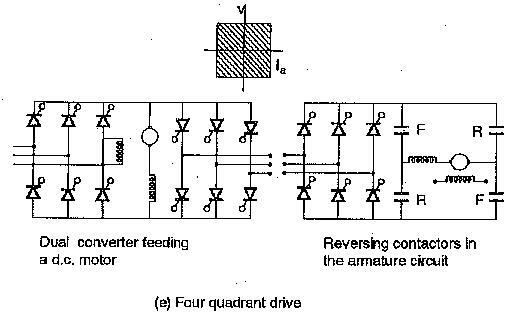 Also, in Three Phase Drives when freewheeling comes into existence the number of pulses reduces to three and the perfor­mance is poorer than full converter. Therefore the performance improvement in single phase drives is considerable compared to three phase drives.